Rosemary has traditionally been used to normalize oil production, encourage healthy circulation and improve scalp conditions. Wheat protein helps strengthen the hair strands giving your hair a fuller, healthier look and feel. 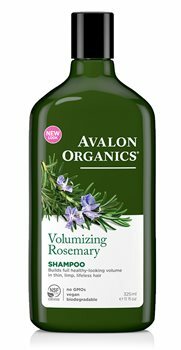 Organic Rosemary Essential Oil, Wheat Protein, Organic Aloe and Vitamins help strengthen and thicken thin, limp, lifeless hair creating full volume and healthy shine. Aqua (Water), Aloe Barbadensis Leaf Juice(1), Cocamidopropyl Betaine, Sodium Laurylglucosides Hydroxypropylsulfonate, Glycerin, Sodium Cocoyl Isethionate, Stearic Acid, Sodium Lauroyl Sarcosinate, Calendula Officinalis Flower Extract(1), Dioscorea Villosa (Wild Yam) Root Extract(1), Rosmarinus Officinalis (Rosemary) Leaf Extract(1), Styrax Benzoin Resin Extract, Cedrus Atlantica Bark Oil, Citrus Medica Limonum (Lemon) Peel Oil, Citrus Medica Limonum (Lemon) Peel Oil, Copaifera Officinalis (Balsam Copaiba) Resin, Coriandrum Sativum (Coriander) Seed Oil, Geranium Maculatum Oil(1), Lavandula Angustifolia (Lavender) Oil, Pogostemon Cablin (Patchouli) Oil, Rosmarinus Officinalis (Rosemary) Leaf Oil(1), Arginine, Bisabolol, Hydrolyzed Wheat Protein, Sodium Citrate, Sodium PCA, Panthenol, Tocopheryl Acetate, Guar Hydroxypropyltrimonium Chloride, Alcohol(1), Benzyl Alcohol, Potassium Sorbate, Sodium Benzoate, Coumarin, Limonene, Linalool. I have thin hair structure and this shampoo is amazong - it cleans well, gives volume and hair stays fresh longer. I recomend! I have fine hair and I found this shampoo great for volumizing the hair .It also feels thicker to touch. Would recommed this product...meets expectations. Also quick delivery and good price. Has a nice herby smell and leaves the hair feeling clean and shiny.